Good morning from MACAROON LAND!! 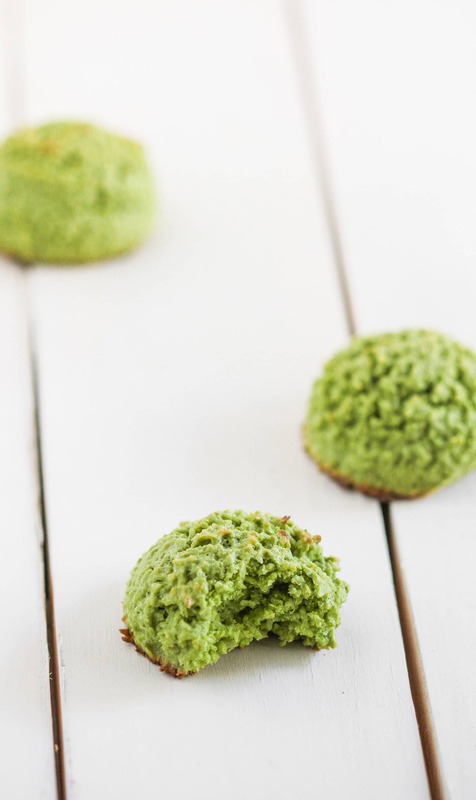 These Healthy Matcha Green Tea Coconut Macaroons are heaven. They’ve got the perfect balance of matcha + coconut flavors — neither one overpowers the other — they’re supremely delicious and addictive, and best of all, they’re GOOD FOR YOU! 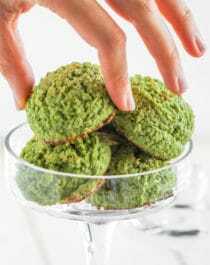 These Matcha Green Tea Coconut Macaroons are made without any sugar added. That’s right. These are sugar free. Oh, and they’re also low carb, gluten free, AND dairy free! But shhhhh, don’t tell. No one would ever know ? I love the chewy texture of the coconut, the deep matcha green tea flavor, and of course, the perfect sweetness level. I’ll definitely be making these Matcha Macaroons again soon… veeery soon. Preheat the oven to 350 degrees Fahrenheit and line a cookie sheet with parchment paper. In a small bowl, mix together the coconut, matcha, and salt. Set aside. In an electric stand mixer bowl fitted with a whisk attachment, add the egg whites. Beat on medium speed for 2 minutes. With the mixer running, slowly add the erythritol. Beat for 3 minutes. With the mixer still running, add the vanilla, stevia, and almond extract. Beat for 2 minutes. Turn the mixer off and dump in the coconut mixture. Fold together, mixing well. It’s totally fine to mix the air out of the fluffed egg whites, in fact, that’s WHAT YOU WANT! When the mixture is completely even, use a cookie scoop to portion the mixture evenly onto the cookie sheet. Bake for ~14 minutes, or until the bottom of the macaroons turn golden brown (do not overbake!). Let cool on the pan, and serve. Best served the day these are made! Prescription Instructions: eat at least two Healthy Matcha Macaroons every 5 hours with a glass of (almond) milk, or as directed by your healthy dessert doctor (me) or until desired effect (i.e. happiness) is achieved ?